Last week I had the good fortune to attend the 2016 Honeywell Users Group Americas event in San Antonio, Texas. At this annual event, Honeywell customers from around the world come together to solve common problems in SCADA/ICS and attend keynote speeches and roundtable discussions on topics such as the industrial internet of things (IIoT), cybersecurity, alarm management, and more. It also served as the first public exhibit of the results of the partnership we announced with Honeywell in February to jointly develop industrial cybersecurity solutions. As described in Honeywell’s keynote address, Honeywell has integrated Palo Alto Networks Next-Generation Firewall technology into their industrial cybersecurity solution, Risk Manager, to provide advanced network traffic inspection. With our next-generation firewall technology, Honeywell’s industrial control customers will have much more insight into who is using which applications on the network, what assets and data they are accessing, and what threats may be trying to breach or pivot around the OT network. With that information, customers can take a more proactive approach to industrial cybersecurity, even protecting their networks from previously unknown attack methodologies. In addition to our next-generation firewall technology, Honeywell is offering the Palo Alto Networks WildFire WF-500 zero-day, on-premises sandboxing device to augment theirHoneywell Managed Industrial Cyber Security Services offering. Designed to provide cybersecurity consulting services to customers who don’t have the required expertise in-house, the services offering uses WildFire to provide Honeywell’s security experts with the latest threat intelligence in real time. 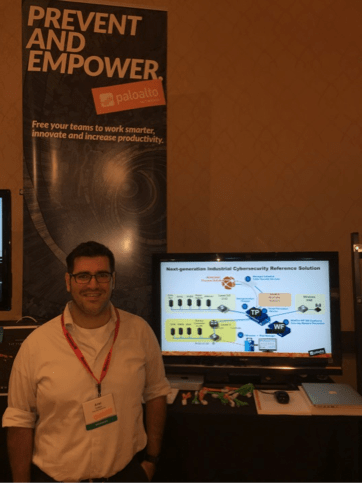 Ariel Cohen of Palo Alto Networks at the 2016 Honeywell Users Group. The monitor displays a diagram of Honeywell’s industrial cybersecurity reference solution featuring Palo Alto Networks Next-Generation Firewall technology. If you’d like to learn more about Honeywell’s integration of Palo Alto Networks next-generation security technology, you can download this solution brief. For more information about cybersecurity and the IIoT, take a moment to read some other blog posts I’ve authored on the subject.